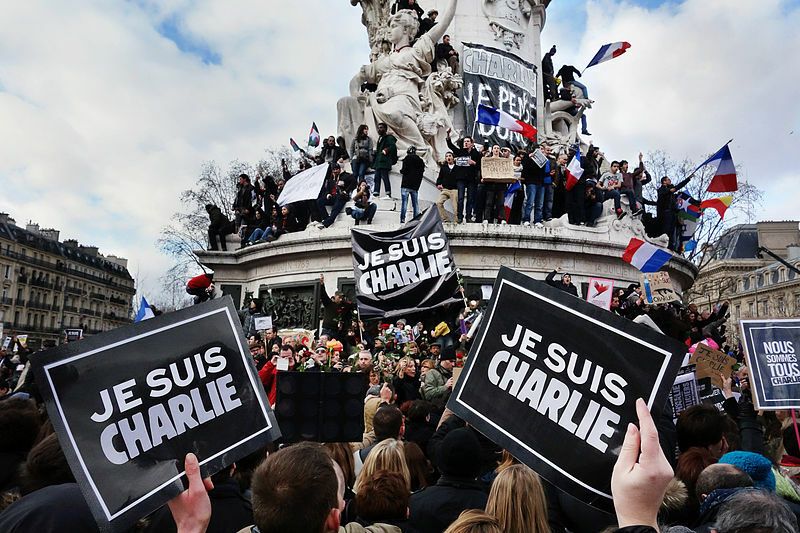 The recent terror attacks in Paris have been a central theme in Western news outlets for the last couple of weeks. The outrage at these cowardly attacks is understandable, and responses from Western European leaders have shared some common themes. Condemnation for the murder of innocents, the assault against “free speech” and the “free press,” and vows to do more to fight terror were repeated across Europe. But precisely what can we expect in the way of increased defense of freedom of expression? The details are a bit less clear-cut than the rallying cries. Image by Olivier Ortelpa, wikimedia commons. In his condemnation of the attacks, US President Obama—that same fellow who claimed he would build the most “transparent” US government in US history— wisely did not specifically address the “free speech” or “free press” aspects of the attacks in his response. It simply would have been too ironic right now, considering the “transparency” we have enjoyed from the White House about matters like Afghanistan. Remember that war in Afghanistan that ended last year? The one that is no longer a war, but that we are still funding and fighting? That war is part of the US global war on terror. The basic reason for conducting the global war on terror is to defend the freedom of the people of the US and, by extension, the freedom of our allies. Freedom is an important thing, and a “free press” is an important aspect of it. Unfortunately, right about now, “free press” doesn’t apply to our conduct of the not-really-a-war in Afghanistan. Every quarter the US military delivers vital statistics concerning the Afghan not-war to the US Special Inspector General for Afghan Reconstruction, John Sopko. These statistics include evaluations of the progress of the fledgling Afghan Army, police forces, and national government at large. The reports also include information about bribery and corruption in the Afghan government. In his previous evaluations, Sopko has been critical of the cost and lack of results in Afghanistan. His evaluations were shared with the people of the US. This quarter’s statistics were declared “classified” by the US Army. John Sopko and his staff will receive the information, but they will not be able to share it with us. We don’t get to know who specifically made that decision. My suspicion is that the decision to classify the data came from the White House. The rationale is the old “we don’t want this vital information to get into the hands of the enemy” ploy. However, by “enemy,” we can’t be sure if the Army is referring to the Taliban or the US taxpayers that are starting to wonder where the hell all the money went in Afghanistan. About now, our French readers are enjoying a good laugh at those politically and culturally less sophisticated Americans. Go ahead and laugh. You should. But then take a closer look at things in France. While addressing members of the French Navy on board the French carrier Charles de Gaulle, French President Hollande said, “I continue to regret the fact that the international community did not act in the required time to stop massacres in Syria and prevent extremists from gaining even more ground.” Indeed. There is much room for regret. Hollande forgot to mention that of all the major European nations, France has been the most reluctant to get involved in Syria. Hollande has thus far declined to conduct air strikes in Syria. He was probably counting on French voters to forget that he only authorized the French military to conduct strikes against ISIS in Iraq and not in Syria. So other than photo ops on an aircraft carrier, what has the French government done in response to the terror attacks? But let’s not pick on Hollande. There is plenty of French hypocrisy to go around. Angry at Fox news for referring to Islamic enclaves in Paris as No-Go Zones, Paris Mayor Anne Hidalgo stated that Paris will sue Fox news. I think the statement was made between passionate cries of “Je suis Charlie Hebdo” and “Vive la presse libre!” Clearly, France is not going to tolerate Fox news having an opinion about Paris neighborhoods. Since they are not busy in Syria, will Hollande authorize a carrier strike against Fox News? UK Prime Minister Cameron was, of course, quick to denounce the attacks in Paris, and he made clear the importance of free speech and a free press. That’s a nice sentiment, but how far does it go? Does it apply to his government? Perhaps not. The UK government has joined other European governments in wanting to require “back door access” to be built into social media products so that European governments can more easily spy on its citizens without a warrant. The government of the nation that invented the concept of the warrant doesn’t think it needs one to routinely listen to private citizens on social media. As for “free press,” time will tell how free the UK Ministry of Defense has been with information about their planned reductions in the UK military. There are currently allegations making the rounds on Fleet Street that the Ministry of Defense is planning much larger cuts than what they are currently admitting to the public. If this all sounds too sinister and depressing, don’t worry. By comparison, people in Western Europe, Canada, the US, Australia, NZ, and Japan still enjoy a higher degree of freedom than the rest of the world. The fact that I can write this article without expecting to get arrested is proof of that. As long as we can remember to frequently and publicly laugh at our politicians, there is hope that freedom will survive. Thank you for your comment, Mr. Gill. Holmes is not available to respond to comments at the moment, but he does value them and will respond as soon as he is able.